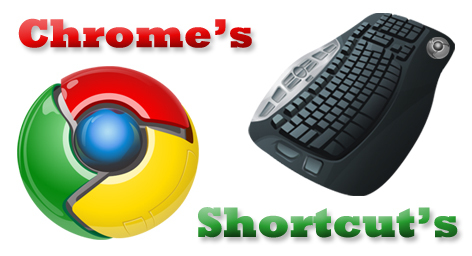 Google Chrome shortcuts provide an easy and effective way to improve your Internet browsing performance. In This blog you will get some shortcuts to boost up your efficiency using the Google Chrome Web browser. Many people feel that Google Chrome performs much better than other web browsers. As i found my own research its true and by using some easy keyboard shortcuts that i posted in this blog can make Chrome’s Internet browsing performance much faster then others. In my words "Shortcut key is a combination of keystrokes or a way to perform a task very quickly"
Ctrl + A, Ctrl + C, Ctrl + Z etc. Here "Ctrl + A" means you should hold down the Ctrl (control) key and then press the letter "A" on your keyboard. You can use some other keys with combination like "Shift", "Alt", "F1,F2......F12 etc. Type a search engine URL, then press TAB, type a search term, and press Enter – Perform a search using search engine associated with the URL. Ctrl + Enter after typing base web address – Automatically add 'www.' and '.com' what you have typed in the address bar and open that web address. Ctrl + K – Initiate a Google search with the address bar. After typing the shortcut key, a '?' will appear in the address bar. Type your query then press Enter.